A few weeks ago, Preshit showed me this app on his phone called Mextures by Merek Davis. I used it for a bit and was really impressed. I assumed it would be your typical filters app that had everything important only available as in app purchases. I was so wrong. I couldn’t believe the amount of stuff the app had and how gorgeous it looked. Fast forward to a few days ago, Mextures 2.0 hit as a free update to the original app, making it one of the best photography apps on the iPhone available today. Mextures was originally just an app that let you apply textures (that you can mix) to your photos. This involved you relying on another app to do all other editing. Mextures 2 now is a full fledged photo editing app for iPhone with a really interesting take on collaboration. 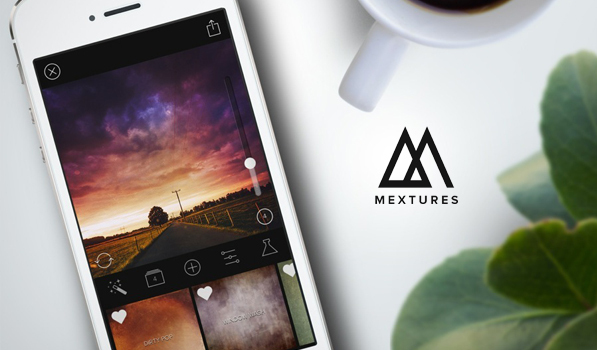 The main screen in Mextures has a stunning photograph in the background and a big Mextures logo. The 4 glyphs at the bottom represent your formulas, an inspiration grid, a news section and a help page. The Camera and Library buttons let you access those sections. You can import photos from your library or use the camera within the app and after you have your photo, you are prompted to square crop it. While this is more suited to Instagram and the likes, there is an option to not crop at all. Once you are happy with your image crop, you can pick from the predefined (and huge) set of formulae already present within the app. The fine tuning available in the app puts almost every other photo app to shame. After you’ve picked a formula, you now have the ability to emulate well known processing techniques with 26 new presets. As with other great social apps, the community contributions are amazing. 2.0 lets you share formulas and save your own custom ones for future use. The importing technique is really nice. You generate a code that can be copied and shared via the usual means and just entering that code lets someone import the formula. The News section is probably the best looking news section I’ve seen in a long time. I can’t get over how awesome it looks with those photographs and typography. I love the Inspiration section for the same reason. It is hard to believe most of these photos if not all of them came from an iPhone. If you’re pressed for time, I’d stay away from this section because you will end up tapping images and liking quite a bit of stuff on Instagram. Mextures delivers insane value with its low price of entry. It is an absolute must buy for any photographer or photography enthusiast that owns an iPhone. I hope a future update fixes the first launch tutorial because the amount of information in some screens is a bit overwhelming and cramped. Mextures is available for the absolutely insane low price of $0.99 for a limited time before it goes back up to $1.99.